April 4, 2019 - Salisbury Academy’s 10th annual Bloom in Wonder Gala was a whimsical adventure and festive showing of community support for education and other local needs. Held March 30 at the Back Shop at the N.C. Transportation Museum, Bloom in Wonder brought 300 people together for an evening that included dining, dancing, a live auction, and upbeat music from The Band Punch. The gala was set among lights, trees, oversized flowers and pops of color that accented the historic setting of the Back Shop. March 7, 2019 - Elsie Richter is creating her own masterpiece by helping her peers create works of art. 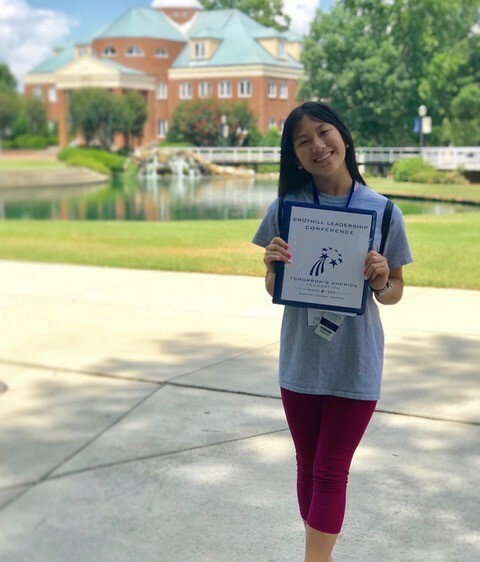 An eighth-grader at Salisbury Academy, Elsie had a bright idea in one of her middle school elective classes, called exploratories, last year. "I remember it hit me, and I said, 'Hey, what if I led my own exploratory?'" Elsie says. After sharing the idea with the middle school division director and getting approval on her concepts, Elsie's class began to take shape. Coding and programming are passions of Elsie's, so she first considered the idea of teaching computer animation before settling on the topic of mixed-media art. 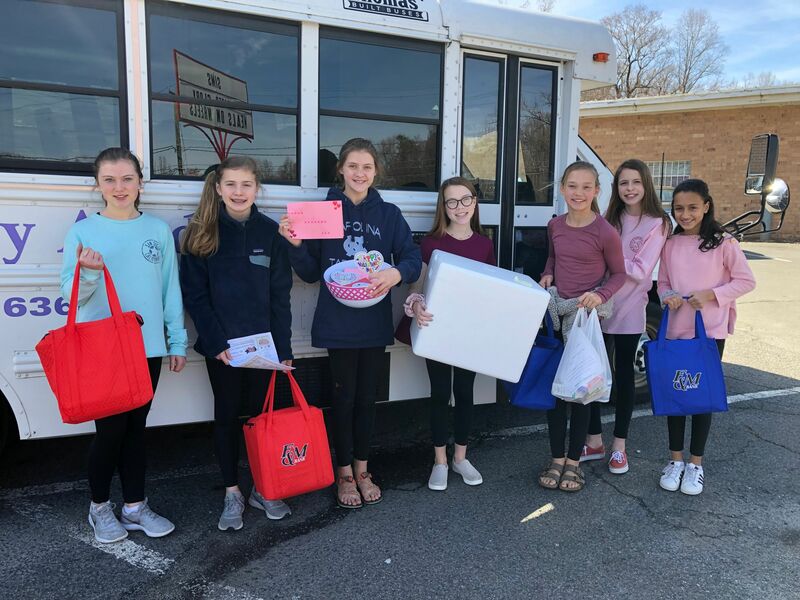 February 21, 2019 - This Valentine's Day, a group of middle school students from Salisbury Academy shared smiles, Valentines and warm meals in a delivery for Meals on Wheels. 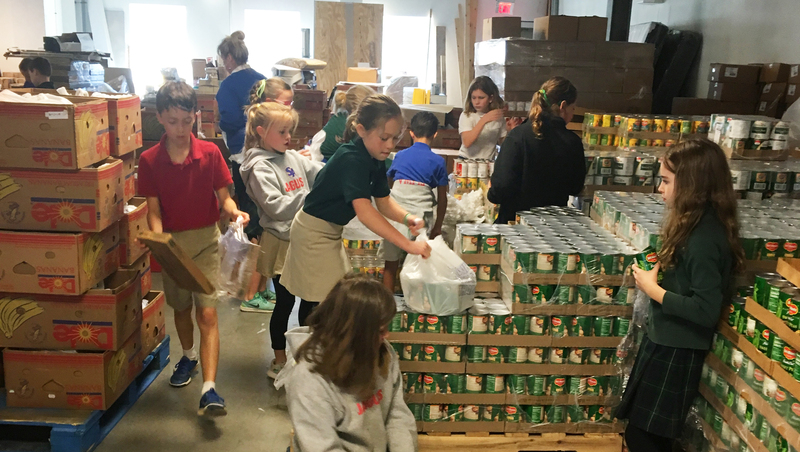 As part of the middle school advisory program in which students meet weekly in small groups to build camaraderie between students and teachers, set goals and build teams, advisory students also carry out community service projects. February 14, 2019 - Fueling student passions while providing parents with opportunities for their children in the hours outside of school, Salisbury Academy launched enrichment programming this year. 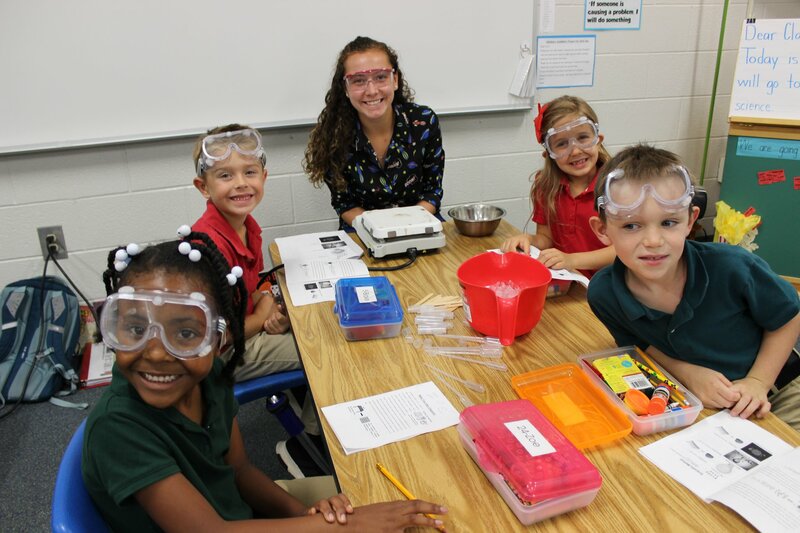 A mix of the arts, STEM, and other areas of interst, enrichment offerings at the school change each semester, are offered by age group, and are led by area experts. 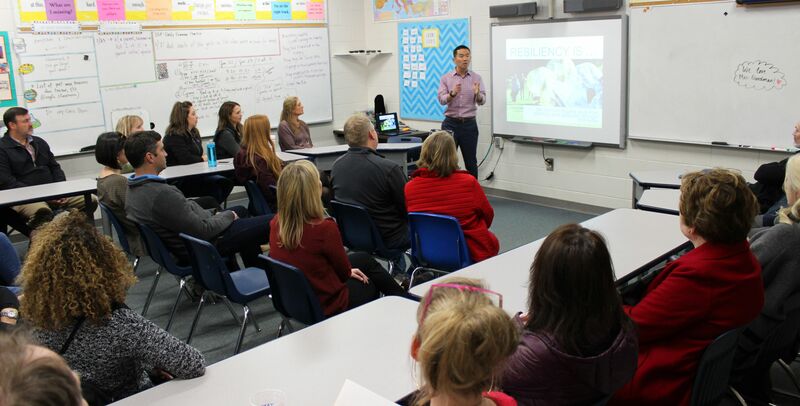 January 31, 2019 - Counselor and adolescent mental health expert Jonathan Hetterly of Southeast Psych in Charlotte spoke on resiliency and how parents can prepare children for success as adults at Salisbury Academy recently. In today’s world where mental health far outweighs academics as the primary reason that children don’t succeed, kids need space to figure life out, to learn, fall down, and get back up, Hetterly said. It is through these experiences that they learn resiliency, or the ability to bounce back from adversity. View Hetterly's Jan. 24 presentation slideshow here. November 26, 2018 - Hikers hit the trails of Eagle Point Nature Preserve on a beautiful autumn afternoon in an outing organized as a partnership between Muddy Sneakers and Salisbury Academy. “Seeing families and friends explore the preserve together was such a delight,” said Elise Tellez, Piedmont field office director for Muddy Sneakers. September 27, 2018 - Rowan County has gained ten more young leaders, driven to lead and inspired to make a positive difference in their community.As part of its strategic mission to develop leaders and stewards of the community, Salisbury Academy, through its Broyhill Leadership Scholarship program, provided scholarships for ten students from Rowan-Salisbury high schools to attend this year’s five-day Broyhill Leadership Conference. September 27, 2018 - In a meaningful school-wide tradition, Salisbury Academy’s students and staff gathered for their annual “See You at the Pole” gathering on Wednesday. Held on the fourth Wednesday of September, the student-led rally brings millions of students together in prayer across the globe. August 2, 2018 - Each Wednesday at Salisbury Academy’s summer program, campers arrive with a special set of essentials: bug spray, sunblock, a bag lunch and a curiosity about where the next outdoor discovery will be. Will it be a new insect under a rock? A colorful fungi beside a trail? Anything is possible on Muddy Sneakers Outdoor Expedition Day. Thanks to a new partnership between Salisbury Academy and the environmental education organization Muddy Sneakers, every Wednesday at the summer camp is an off-site expedition day to a variety of parks and natural sites such as Boone’s Cave Park, River Park at Cooleemee Falls and Eagle Point Preserve. 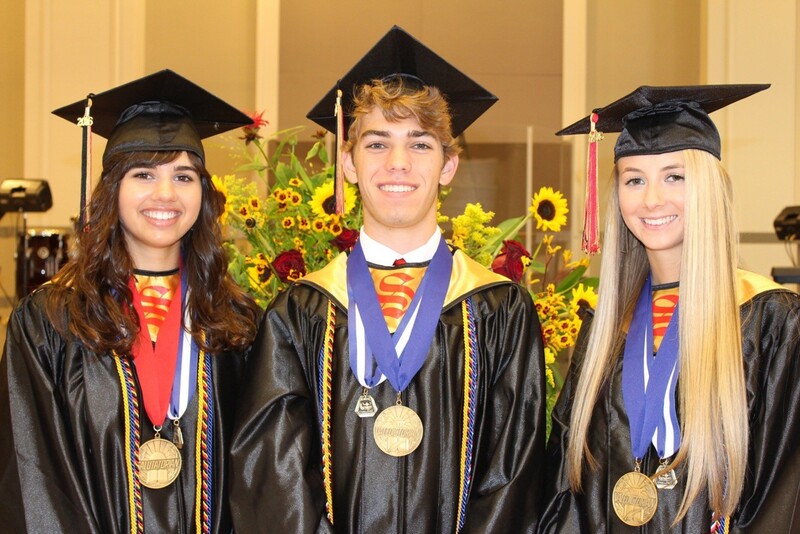 June 10, 2018 - Members of the Salisbury Academy Class of 2018 will move on to Cannon School, East Rowan High School, Jesse C. Carson High School, Rowan County Early College and Salisbury High School after their recent graduation. May 10, 2018 - With every new school year comes new opportunity for growth, and Salisbury Academy is leveraging the upcoming year's opportunity to light a spark. In August, the school will open the SA Spark Center, a combination of science labs, art room and a new maker space. Repurposed from what is currently the junior kindergarten and kindergarten building, the Spark Center will be a place where students are free to invent, solve problems, and explore while discovering their interests and a lifelong love of learning. May 5, 2018 - The first year of the Salisbury Academy Bass Fishing Club has been one for the history books — no fishermen’s tall tales or exaggerations required. 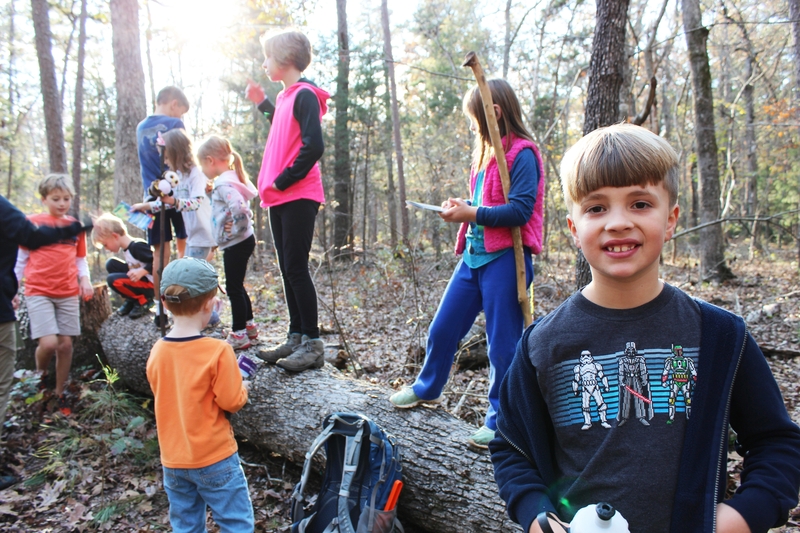 Inspired by teachers and with an enthusiastic group of middle school anglers, the club has offered a new means for students to get out into nature and develop a passion for the outdoors. 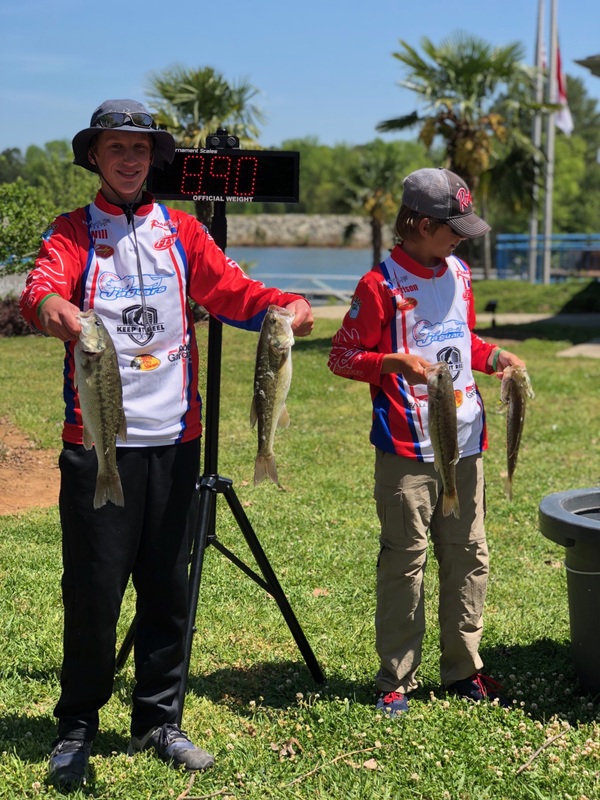 In addition to enjoying group fishing at Corriher Lake and trips to Bass Pro Shops for fishing seminars, student anglers competed in the North Carolina Junior High Tournament Trail on nearby lakes. March 22, 2018 - Salisbury Academy’s ninth annual Bloom gala on March 17 served as a joyful reflection on the school’s history and a celebration of the community that has supported the school’s mission and culture for a quarter century, school officials said. 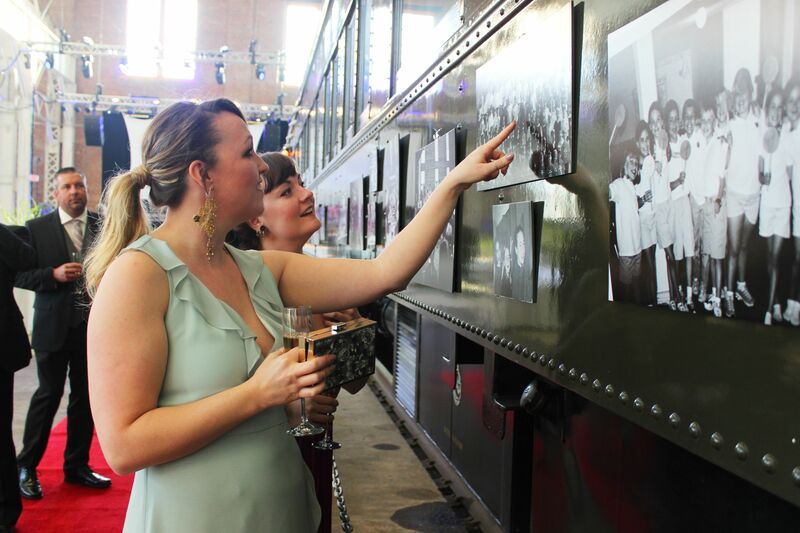 Held in the Back Shop of the N.C. Transportation Museum, Bloom in Celebration brought 350 people together for an evening of sharing memories and learning about the latest news at the school, all while enjoying food, dancing and a live auction. March 15, 2018 - Just as the words on the banner painted by junior kindergartners read, Salisbury Academy students told the community, “Somebody loves you!” in a recent schoolwide day of service. 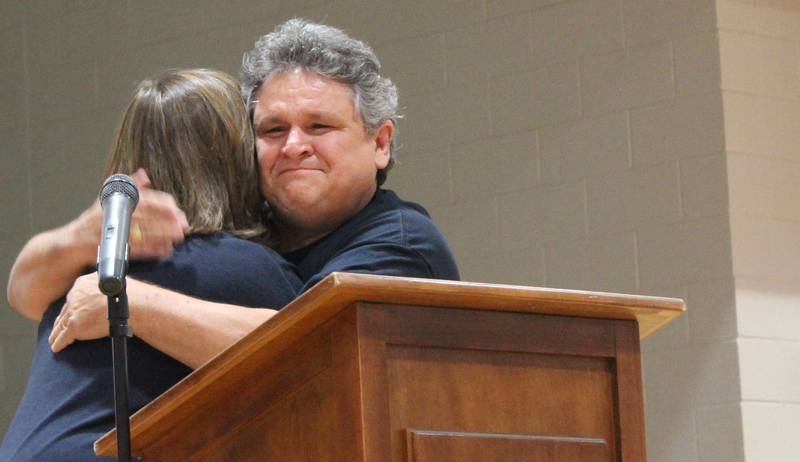 Held in honor of Salisbury Academy’s 25th year, the day celebrated a commitment to caring for others. 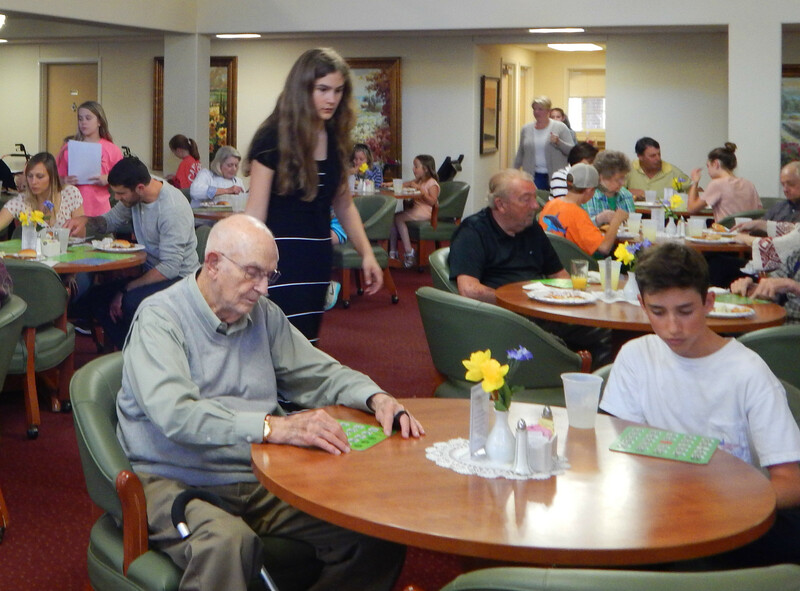 At Carillon Assisted Living, third-grader Emma Ott played the piano for residents while her peers held up the student-made banner. Emma was one of several students who played the piano. A chorus of second- and third-grade students also performed. March 8, 2018 - Designed to strengthen relationships among middle school students and their teachers across grade levels, Salisbury Academy’s middle school advisory program brings students in grades six through eight together in small groups for weekly meetings and lunches. In addition to meetings, advisory groups build camaraderie through team-building challenges and the “drafting” of fifth-graders to join advisory groups each spring. 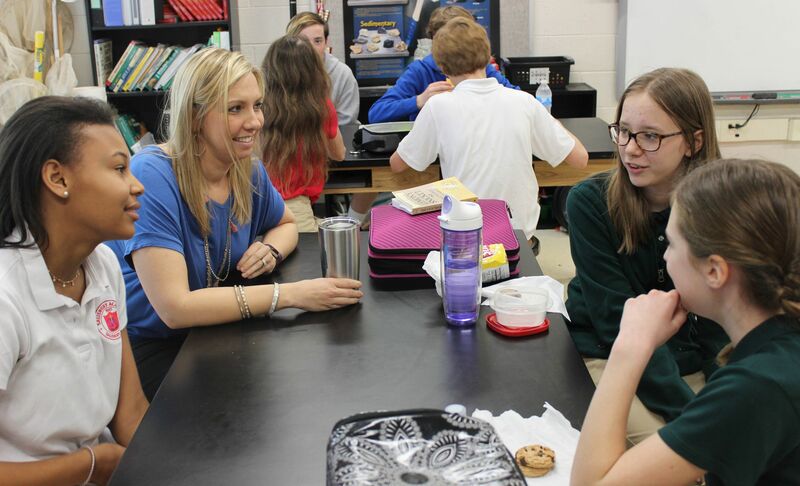 At a typical middle school advisory meeting at Salisbury Academy, advisers and students discuss everything from goal setting to schoolwork and the ups and downs of life in general. February 20, 2018 - Volunteers with the LandTrust for Central North Carolina planted 5,000 hardwood trees in a former farmfield on its Two Rivers property in Davie County on Friday and Saturday. The 153 volunteers came from near and far to join the effort to establish a bottomland hardwood forest that will provide a buffer to enhance water quality just north of the water intake for the city of Salisbury. Corporate volunteers from Michelin, Wells Fargo and Mountain Khaki participated, as well as students from Salisbury Academy, a LandTrust Leopold Society School, and Catawba College. Boy Scout troops 10 and 178 of Cabarrus County also helped plant the trees on Saturday. 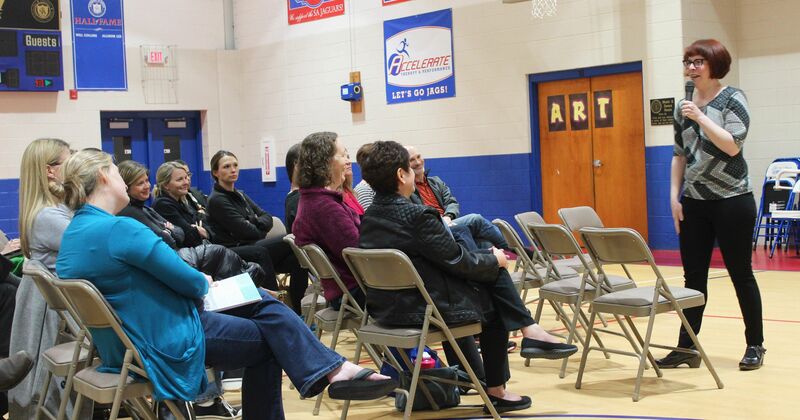 February 15, 2018 - In a community presentation hosted by Salisbury Academy, “Screenwise” author Devorah Heitner presented on helping kids thrive in their digital world. The presentation is part of Salisbury Academy’s ongoing speaker series on the many aspects of developing whole, happy children. February 8, 2018 - Celebrating the 25th year of Salisbury Academy, the Bloom in Celebration gala will be held March 16 at the North Carolina Transportation Museum. This is the ninth annual gala for Salisbury Academy and will offer guests a festive evening celebrating the history of the experiential school. January 26, 2018 - For third grade teacher Nathan Wyatt, a walk through the halls of Salisbury Academy inspires much more than thoughts of lesson plans and upcoming class activities. A Salisbury Academy student for 10 years before graduating in 2009, Nathan shares that each day brings with it “full-circle” connections. 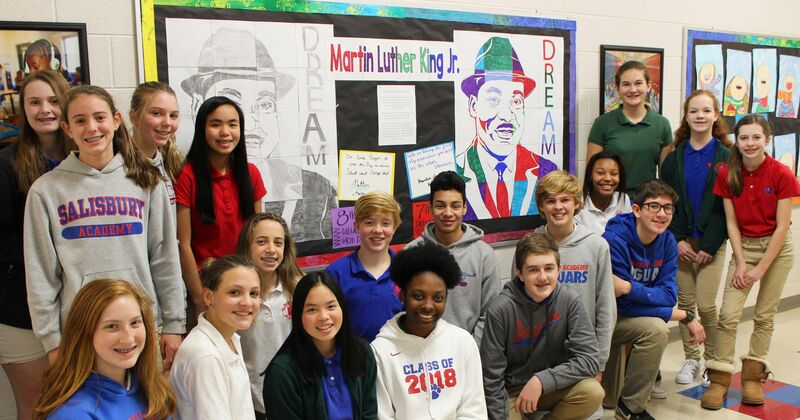 January 18, 2018 - Honoring Dr. Martin Luther King, Jr. and his meaningful work and progress as a civil rights leader, seventh- and eighth-grade art students at Salisbury Academy created two collaborative grid portraits of the historic figure. December 7, 2017 - As Salisbury Academy's third-grade Christmas carolers began to sing at a recent visit to the apartments at Trinity Oaks, the holiday memories rushed back in all their joy and glory for Trinity Oaks resident Marjorie Haworth. "Oh Christmas Tree," "Jingle Bells," "We Wish You a Merry Christmas" are all songs that Haworth directed her choral students in singing over the course of her career teaching elementary music in Shelby. November 23, 2017 - Ask a first-grader at Salisbury Academy about the first Thanksgiving, and he will enthusiastically share details on the pilgrims’ voyage on the Mayflower and what life was like in the new colony. Talk to a third-grader about Native Americans, and she will give you insights into their culture, food and customs. With appreciation for the history of the first Thanksgiving, pupils in the two grades put on their pilgrim and Native American costumes for Salisbury Academy’s annual Thanksgiving feast last week. November 17, 2017 - How do you ensure that a dream lasts a quarter of a century? You invite others to share it. November 2, 2017 - The simplest traditions are often the most meaningful, and this is certainly true for the children and families who participate in the annual Footprints in the Community pumpkin painting. Hosted by Salisbury Academy each year and attended by Footprints participants and Salisbury Academy students, the morning of decorating pumpkins serves as a celebration of friendship, creative arts and the joy of fall. 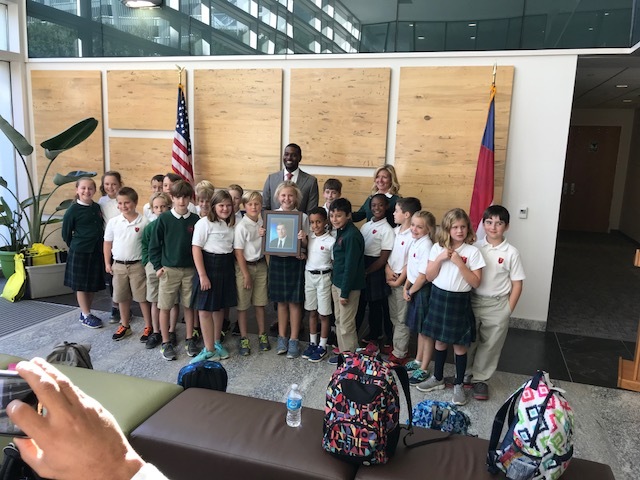 November 2, 2017, RALEIGH - Michael Regan, secretary of the N.C. Department of Environmental Quality, recently met with fourth-grade students from Salisbury Academy who were visiting from Raleigh. Students, their teacher and parent chaperones arives by train and toured the state Capitol, the Museum of History, the General Assembly, the Museum of Natural Sciences, and the Executive Mansion. Their final stop was the Department of Environmental Quality's Green Square building for a visit with Regan. September 21, 2017 - Rowan County has gained twelve more young leaders, driven to lead and inspired to make a positive difference in their community.As part of its strategic mission to develop leaders and stewards of the community, Salisbury Academy, through its Broyhill Leadership Scholarship program, provided scholarships for twelve students from Rowan-Salisbury high schools to attend this year’s five-day Broyhill Leadership Conference. September 7, 2017 - In the first full week of school, first-graders at Salisbury Academy were welcomed to the “big school” by their eighth-grade buddies. Eighth-grade students read to their younger peers and presented them with “welcome to the big school” cards. The first of many meetings that the two grades will have over the course of the year served as an opportunity for the students to meet their buddies, introduce themselves and share in some reading fun. July 13, 2017 - Salisbury Academy reading specialist Melissa Brown recently earned an advanced certification in readi ng instruction. Brown earned the Institute for Multisensory Education Orton-Gillingham certification. She is the only registered tutor in the Salisbury area with this certification. Brown and other literacy educators with the distinction are certified in an advanced understanding of phonological awareness and multisensory strategies for reading, writing and spelling, among other key strategies for literacy education based in the Orton-Gillingham phonics methodology. June 15, 2017 - Salisbury Academy was named an N.C. Green School of Excellence this spring, making it one of only five in the state to hold that disstinction. Eight other schools received award. The Green Schools Program, under the auspices of the Center for the Environment at Catawba College, confers the awards. May 4, 2017 - Salisbury Academy students are taking the protection of soil and water resources into their own hands. After discussing soil and groundwater in a recent science unit, seventh-grade students learned about the dangers of battery toxins leaching into the ground and water resources. They learned that if batteries are disposed of properly, the negative effects on the environment can be largely avoided. April 12, 2017 - Salisbury Academy's Outdoor Learning Space is on its way to becoming a reality! Until now the project has been in a silent phase of fundraising. 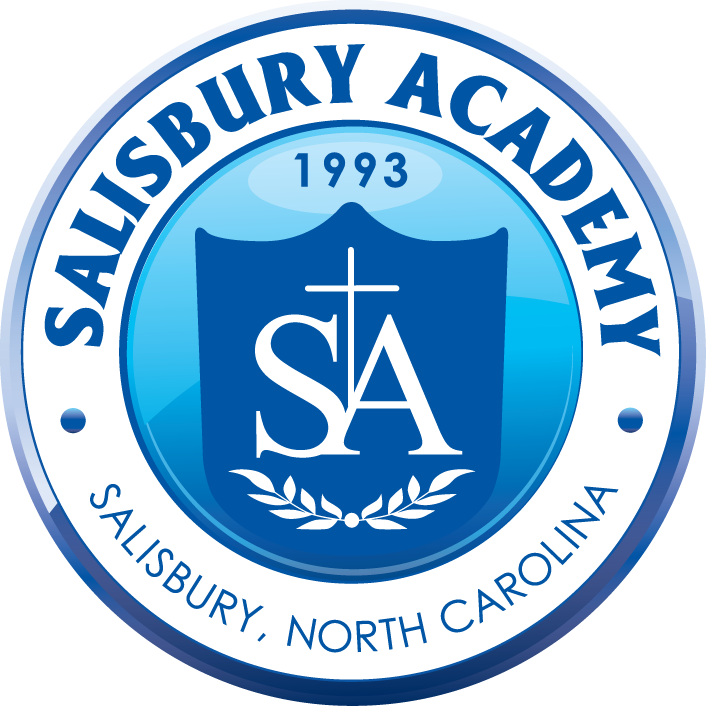 Salisbury Academy is now actively fundraising and seeking community support so that we can get shovels in the ground this spring. We are happy to announce that Salisbury Academy has raised $338,000 to date. 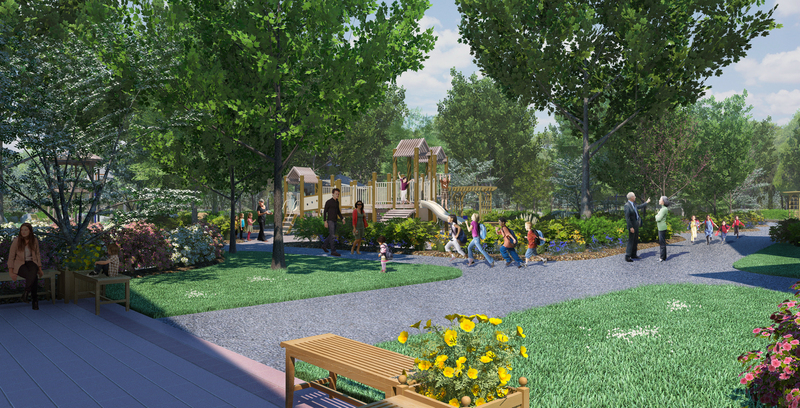 This is just under $100,000 away from the amount required for us to break ground this spring on phase one of our Outdoor Learning Space. March 30, 2017 - Salisbury Academy’s fourth-graders traveled back in time to visit historical figures in their recent “Time Machine Museum.” Figures represented were diverse in the time periods in which they lived and in their contributions to society. They included Martin Luther King Jr., Sacagawea and Neil Armstrong. For the project, each student read a biography on a historical figure and created a first-person oral presentation to share with visitors and classmates. When asked why they identified with their particular chosen figures, students were thoughtful in their answers. March 26, 2017 - It was a dazzling trip back in time to Spencer’s past and a festive showing of community support for education and other local needs at Salisbury Academy’s eighth annual Bloom gala on the evening of Saturday, March 18. 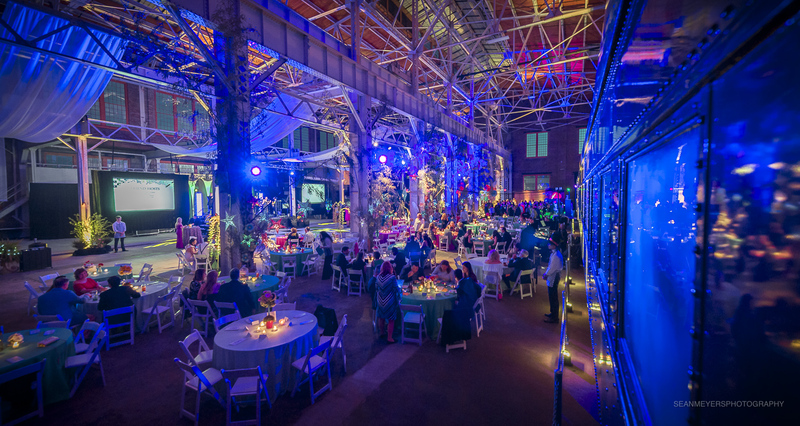 Held at the newly refurbished Back Shop at the N.C. Transportation Museum, Bloom Industrial brought 350 community members together for an evening which included food and drink, a live auction, and dancing to music from The Band Punch. March 16, 2017 - Maggie Dees, an eighth-grader at Salisbury Academy, has been awarded the Sisters Merit Scholarship to Salem Academy in Winston-Salem. Salem Academy is an all-girls, college-preparatory school with a mission of fostering the intellectual, spiritual, social and physical growth of young women. “Maggie Dees is an outstanding young woman with a bright future. 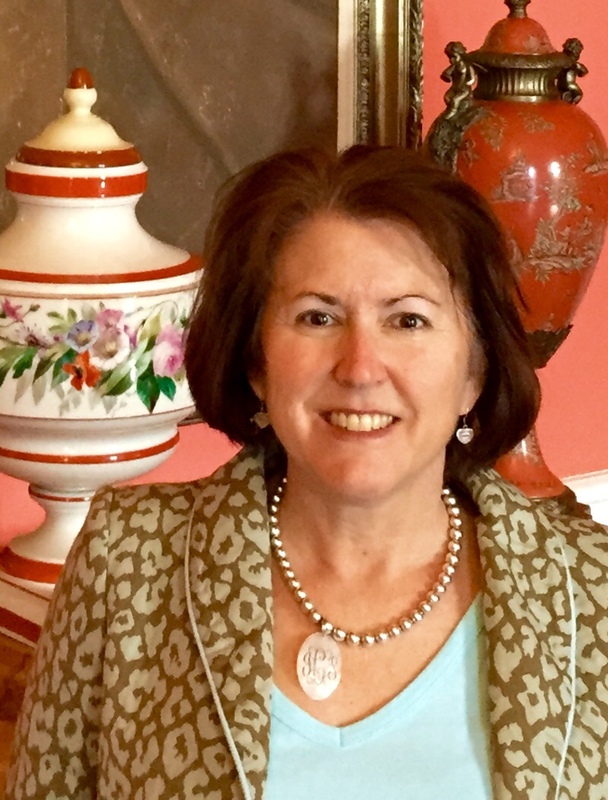 She is curious, engaged, and passionate about what she loves,” said Wynne Overton, associate director of admission for Salem Academy. February 2, 2017 - Making a difference in the world is more than a hot topic at Salisbury Academy — it’s an all-in passion for positive change. Over the past three weeks, middle school students have pondered, identified and formed plans to solve world problems in their weekly Discovery Labs. The question being asked: How do we springboard from our school’s local community outreach to make an impact on larger global struggles? 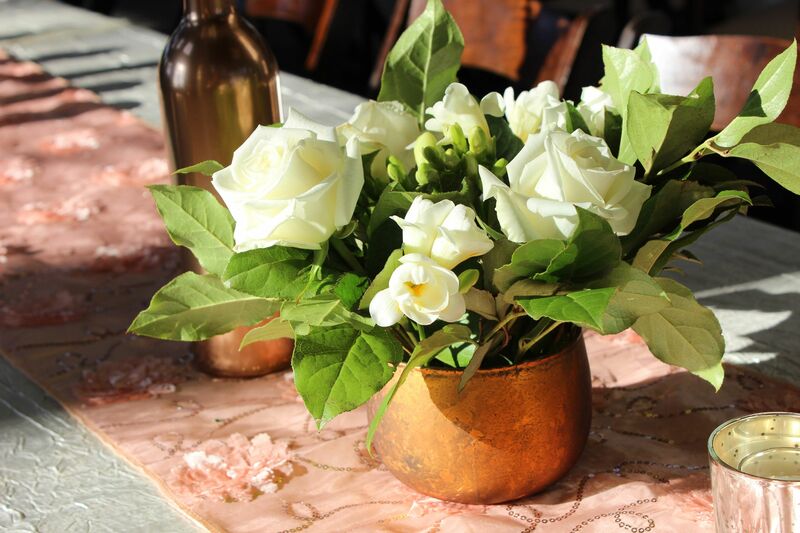 January 28, 2017 - Salisbury Academy’s upcoming Bloom Gala on March 18 brings local history to life through its electrifying theme and location: Bloom Industrial, set in the N.C. Transportation Museum’s newly refurbished Back Shop. 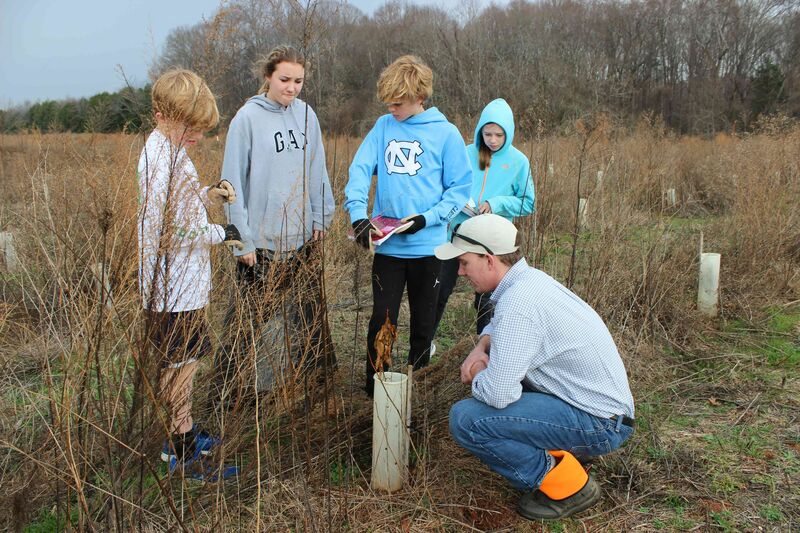 January 23, 2017 - The first Leopold Society event occurred on Jan. 17, when 22 Salisbury Academy students in seventh grade were introduced to the Kerr 2 Property — a 19.2-acre tract of land in Rowan County. In 2015, this LandTrust property was converted into an American chestnut restoration site in partnership with The American Chestnut Foundation. 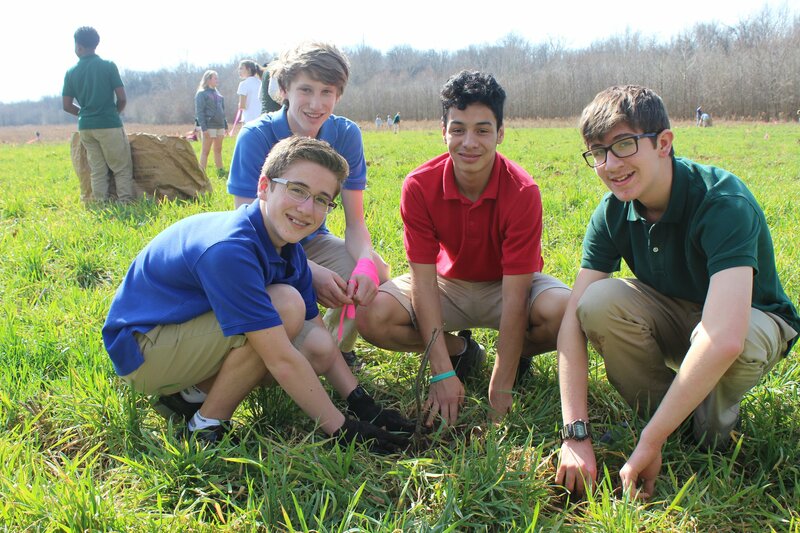 “This project is a beautiful partnership that will ensure our students develop a love for nature and a true understanding of the impacts of conservation efforts, so that they can continue on as adults saving and protecting the spaces they love,” SA science teacher Alexandra Shadroui said. 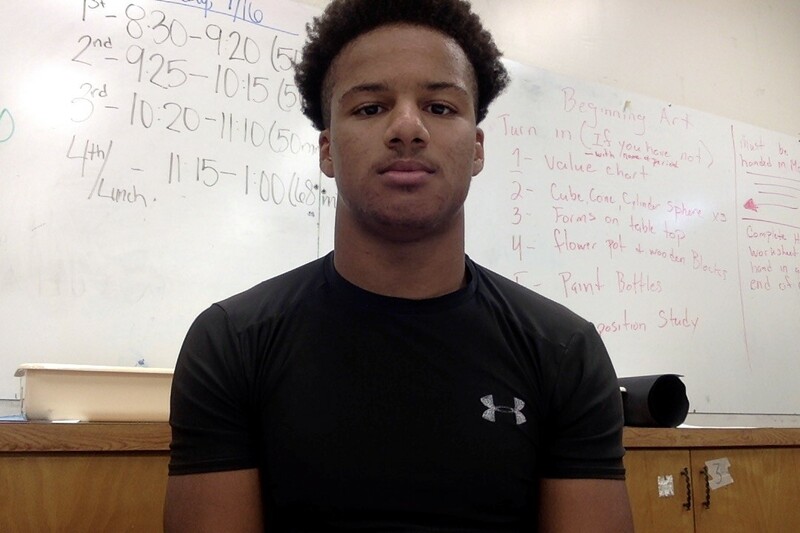 January 12, 2017 - Connecting with and mentoring the younger generations has always come naturally to Antwaun Thompson. It’s simply who he is. 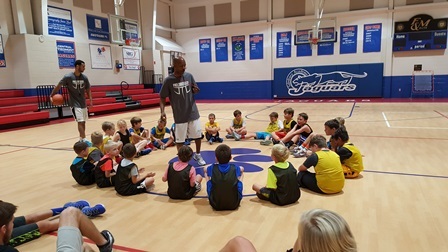 Having witnessed years ago a lack of mentorship in today’s society, Antwaun discovered that basketball — his greatest passion — was an inspirational avenue through which he could help children better themselves. December 22, 2016 - For one of the participants at Trinity Living Center’s adult day services program, it’s hard to remember much about a typical day due to the advancement of her Alzheimer’s disease. 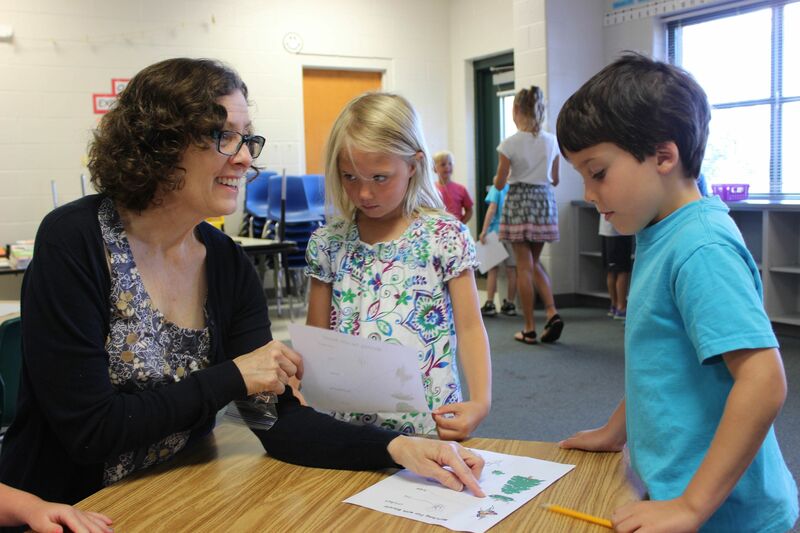 But when Salisbury Academy’s first-graders come for their monthly book buddies visit, she can recount her day to her husband with enthusiasm. December 15, 2016 - As part of its strategic mission to develop leaders and stewards of the community, Salisbury Academy, through its Broyhill Leadership Scholarship program, provided scholarships for nine students from Rowan-Salisbury high schools to attend this year’s five-day Broyhill Leadership Conference. 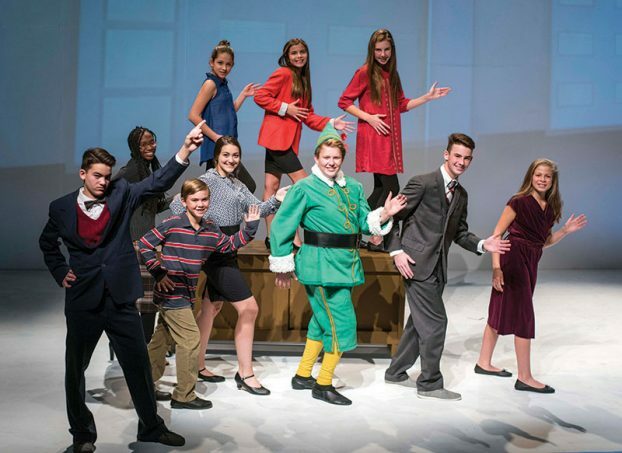 SA Students Review the Norvell Theatre's "Elf"
December 8, 2016 - “I thought ‘Elf’ was great. All the actors were awesome. I loved the play so much. I could watch it a million times and it still wouldn't be boring.” —Ruby W.
December 2, 2016 - ... 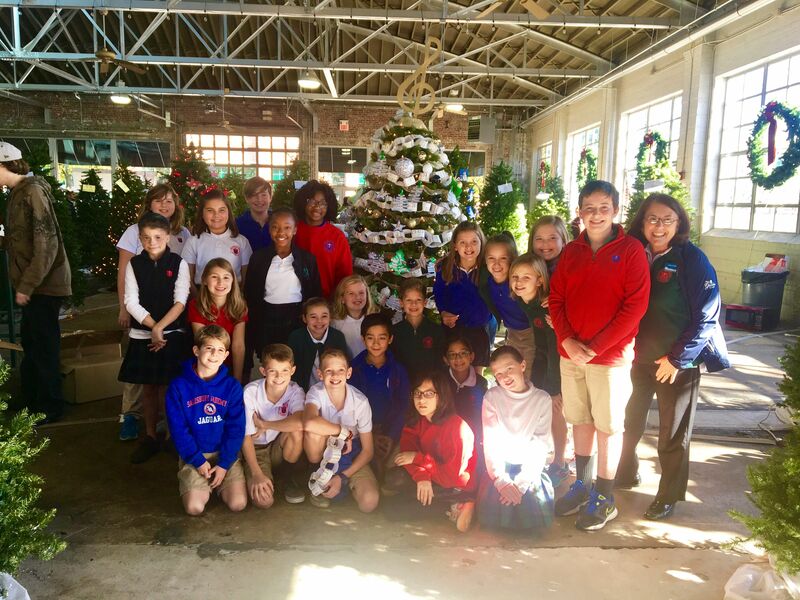 The fifth grade class from Salisbury Academy came up with this year’s “Noteworthy Christmas” tree theme. Each year the class has the responsibility of creating a theme. 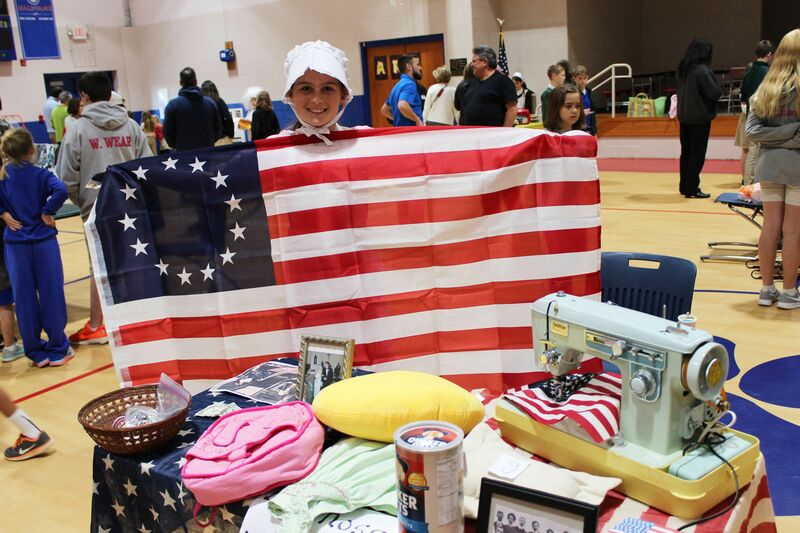 The students voted on the theme, which parent volunteer Paula Mead believes was inspired by William “Dr. Rob” Robertson, a music teacher at the school. 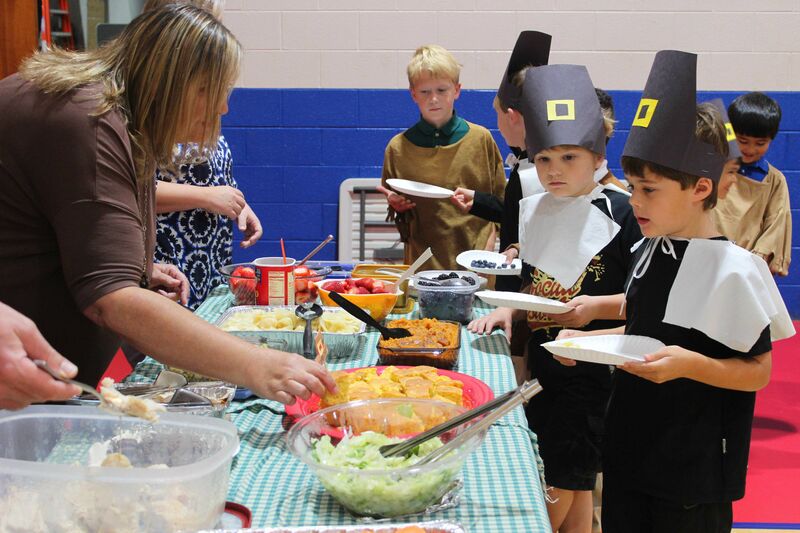 November 24, 2016 - Embracing the many historical and cultural elements of Thanksgiving, Salisbury Academy’s first- and third-graders come together each year as pilgrims and Native Americans to re-enact the first Thanksgiving. November 12, 2016 - It was in the midst of a turmoil-filled election that Salisbury Academy took a quiet moment to present former educator and piano-player extraordinaire “Dr. Rob” Robertson with the state’s highest honor. Head of School Beverly Fowler presented Robertson with the Order of the Long Leaf Pine during the school’s weekly chapel service on Nov. 3. November 11, 2016 - Finding quiet places for students to be one with nature and reflect on connections with the natural world can be difficult in today’s fast-paced world. 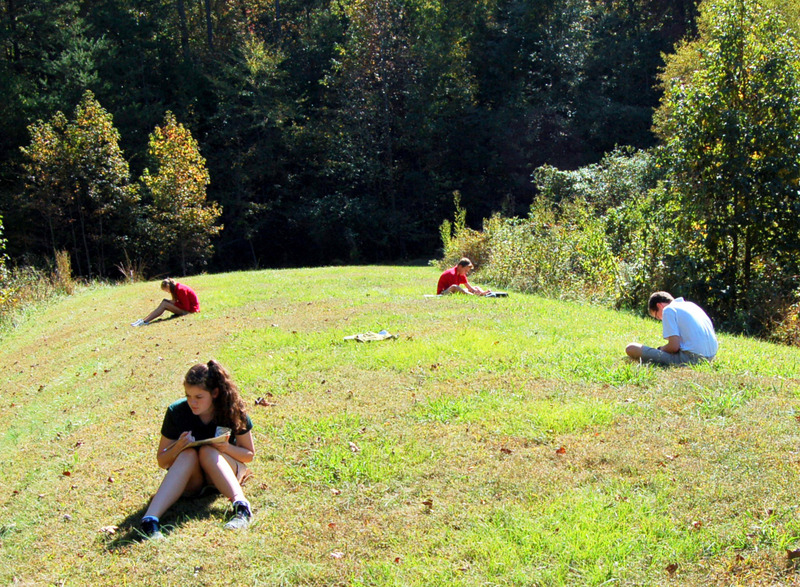 At a recent poetry of nature course, Salisbury Academy’s eighth grade class did just this. In many ways, students found their “Walden Pond” through the experience, or a place where poetry and connection with inner feelings join with writing practice and literary reflection. 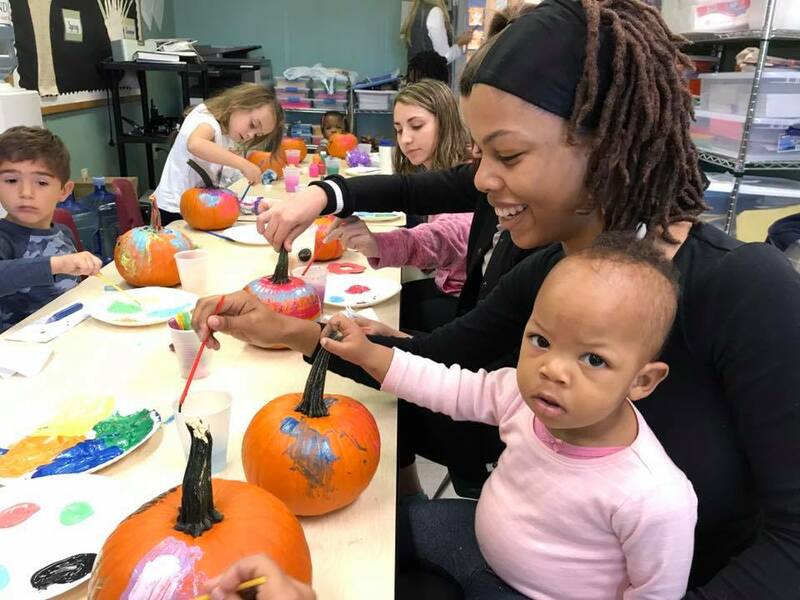 November 3, 2016 - Salisbury Academy and Footprints in the Community joined together for a day of camaraderie and artistic fun at a pumpkin painting event last weekend. Held at Salisbury Academy, the family gathering offered an opportunity for relationship building as well as community inclusion for children with special needs, a cornerstone of the Footprints organization’s mission. October 30, 2016 - Salisbury Academy's "Rock the Vote" middle school exploratory was featured in an article by The Salisbury Post outlining how elections and the electoral process are being taught in Rowan County schools. 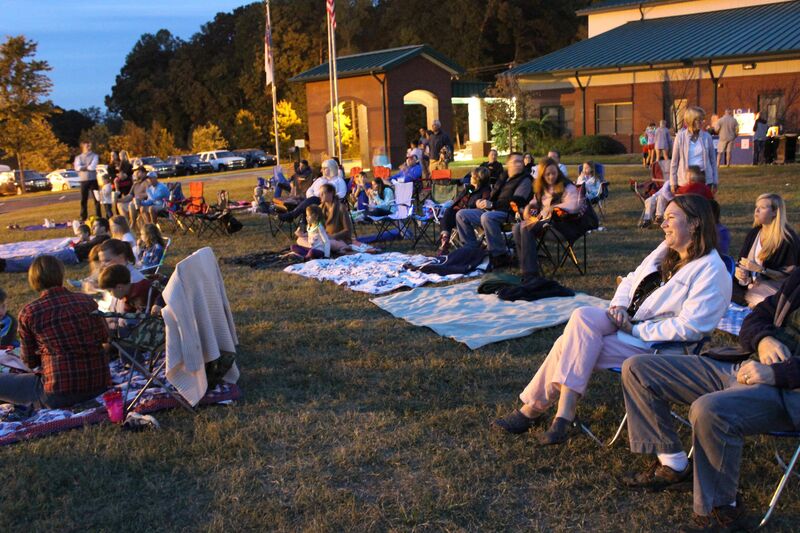 October 20, 2016 - The air was crisp and pumpkins turned into works of art on Friday night as the larger community joined Salisbury Academy in a fall celebration and “Wild and Scenic Film Festival.” Children decorated and bowled with pumpkins along with other fun fall crafts and games as adults chatted and waited for the series of adventure films to begin. 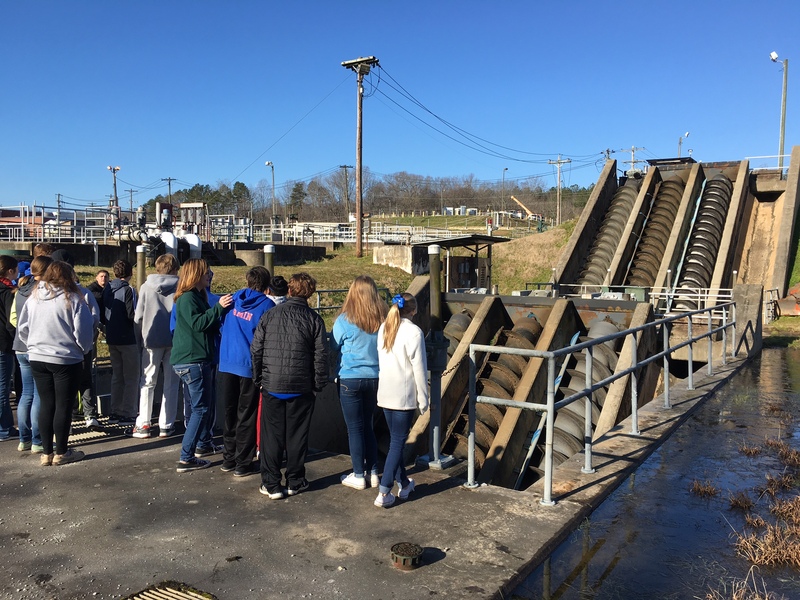 October 6, 2016 - Seated outdoors at a large picnic table in an open forum classroom arrangement, Salisbury Academy eighth-graders shared ideas, facts and interpretations last week on an environmental disaster largely overshadowed by other recent breaking news: the Alabama gasoline pipeline leak. September 29, 2016 - A foggy morning was brightened with song and prayer at Salisbury Academy’s “See You at the Pole” gathering early Wednesday. Held annually on the fourth Wednesday of September, the student-led rally brings millions of students together in prayer across the globe. August 18, 2016 - One evening of fundraising and compassion can go a very long way. At a time when Footprints in the Community - an organization which promotes community inclusion for children with special needs - was ready to reduce their summer camp programming due to funding issues, a portion of the money raised at Salisbury Academy's Bloom Enchanted gala brought the programs back to life. August 12, 2016 - Salisbury Academy begins another school year with a continued commitment to engaging minds and building futures. Recent programming and faculty and staff additions complement the school’s learning environment and will further prepare students to enter their future world as leaders. August 11, 2016 - This year, Salisbury Academy welcomes two new staff members to its family, as well as three new members to its board of trustees: Staff members Jane Current and Hannah Lewis, and board of trustees members Madison Currin, Mark Robertson, and Traci Williams. June 30, 2016 - Twenty-one Salisbury Academy alumni graduated from area high school programs. Salisbury Academy has more than 285 alumni who have graduated since the first graduating class of 1998. 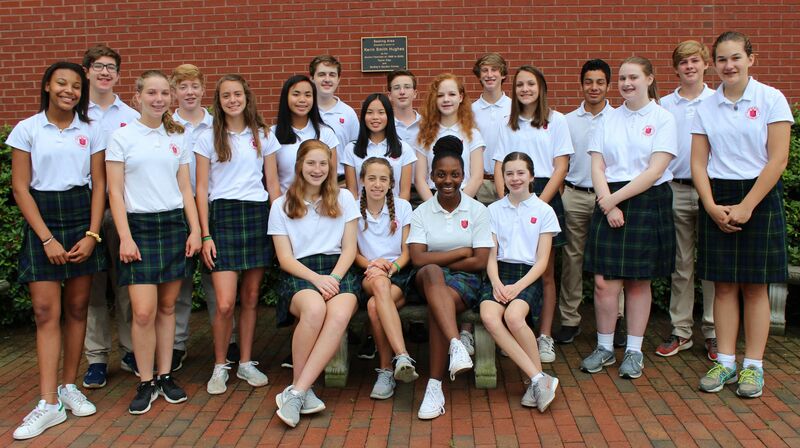 “Each year, as our alumni graduate from high school, it is wonderful to learn about their accomplishments and the exciting experiences ahead of them,” said Head of School Beverly Fowler. June 30, 2016 - Salisbury Academy recently received the N.C. Green School of Promise Award from the N.C. Green Schools Program, a nonprofit organization that promotes sustainability in the state’s schools from pre-kindergarten through 12th grade. 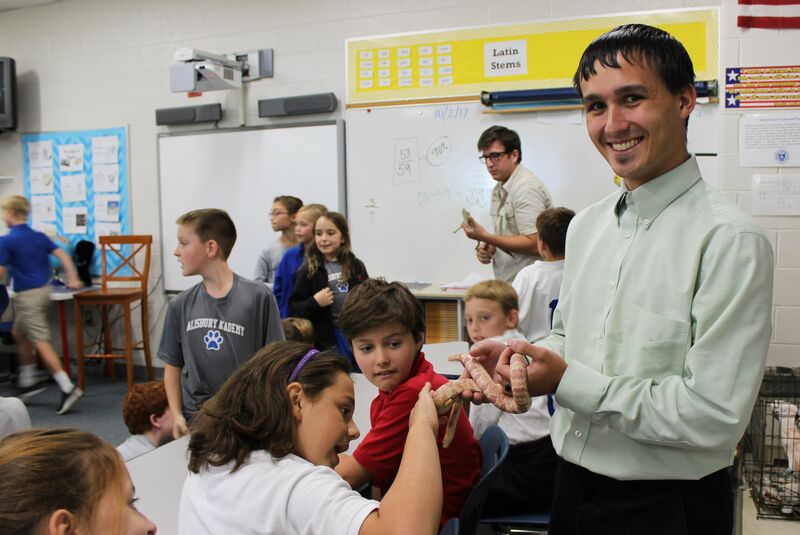 May 26, 2016 -The need for student engagement with the natural world has never been greater. 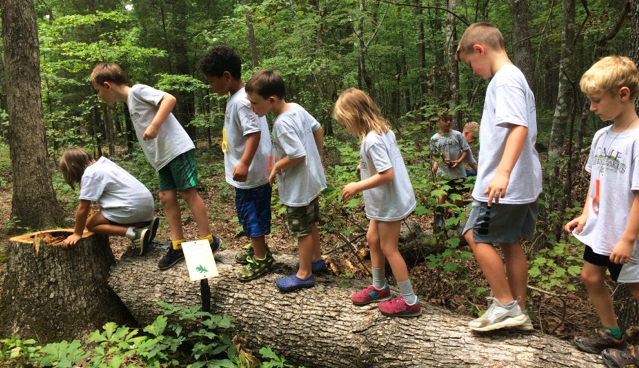 With an increase in the use of technology by children and physical activity often taking a back seat to more sedentary play and learning, a chasm has emerged between children and nature. April 28, 2016 - You could almost feel the butterfly flapping its wings when Karen Leonard, activity coordinator for Oak Park Retirement, called Salisbury Academy teacher Katie Skalka. Would Salisbury Academy be interested in taking part in the butterfly effect — a social movement proving that a small act of kindness can be a catalyst for great positive change — Leonard asked over the phone. SA Students Review the Norvell Theatre's Production of "The Taming of the Shrew"
February 18, 2016 - This week eighth graders at Salisbury Academy went to see the Norvell’s production of the ‘Taming of the Shrew.’ After the show, each student wrote a review of the play. "'The Taming of the shrew’ was a very entertaining play that put a twist on classic Shakespeare literature. The actors and props were amazing!” - Virginia R.